July 2017 27 I n f o r m a t i o n R e q u e s t # 4 4 1 I n f o r m a t i o n R e q u e s t # 4 0 7 wherever specified," advised Krost, who used three 1W LED uplights with a 60W transformer and 25' cable. "Fill in plant - ings, and test for leakage or overflow." Getting Advice Not every contractor can do a water feature alone. "ProPonds West offered technical information and design advice," said Krost. "Also involved was our land - scape designer Harley Barber of Prodigy Design-Build." Irvin had a 3-man crew who worked 190 man-hours to get the job done. He advised to not only have a supporting crew, but a supporting base and the proper equipment. "Make sure the infrastructure under the boulder has plenty of support," he said. "Use a core drill instead of a ham - mer drill, otherwise you could crack the boulder. And, make sure you have the right heavy equipment to move and set the boulder." 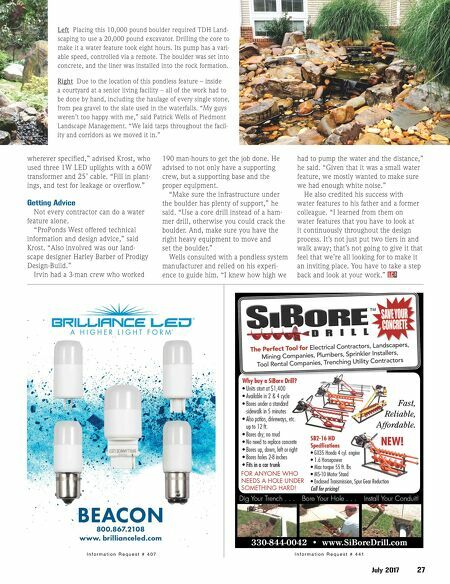 Wells consulted with a pondless system manufacturer and relied on his experi - ence to guide him. "I knew how high we had to pump the water and the distance," he said. "Given that it was a small water feature, we mostly wanted to make sure we had enough white noise." He also credited his success with water features to his father and a former colleague. "I learned from them on water features that you have to look at it continuously throughout the design process. It's not just put two tiers in and walk away; that's not going to give it that feel that we're all looking for to make it an inviting place. You have to take a step back and look at your work." LC DBM Left Placing this 10,000 pound boulder required TDH Land- scaping to use a 20,000 pound excavator. Drilling the core to make it a water feature took eight hours. Its pump has a vari- able speed, controlled via a remote. The boulder was set into concrete, and the liner was installed into the rock formation. 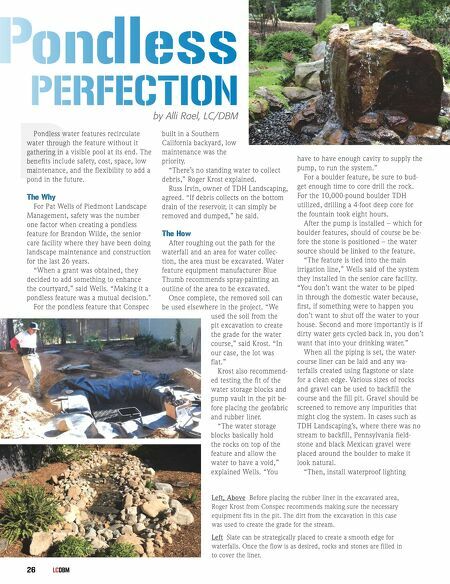 Right Due to the location of this pondless feature – inside a courtyard at a senior living facility – all of the work had to be done by hand, including the haulage of every single stone, from pea gravel to the slate used in the waterfalls. "My guys weren't too happy with me," said Patrick Wells of Piedmont Landscape Management. "We laid tarps throughout the facil- ity and corridors as we moved it in."